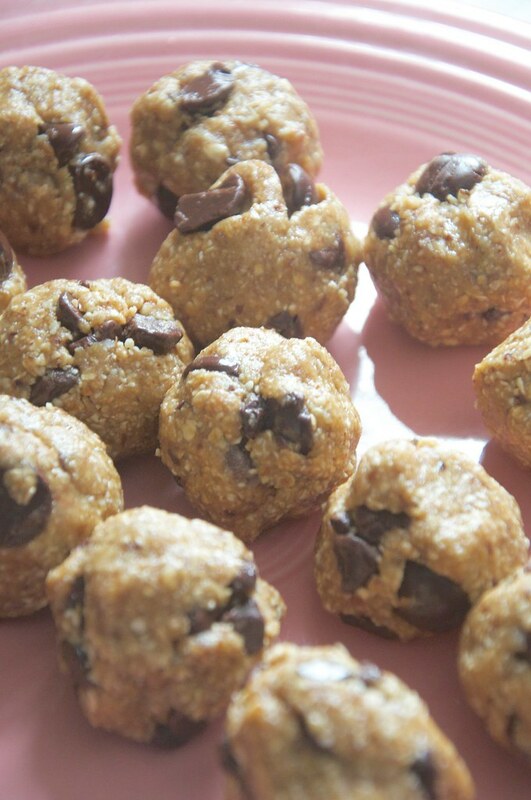 A lot of my energy chunk recipes incorporate either raisins or dates into the mix. I can’t handle even looking at either of those ingredients right now (ugh), so I decided to come up with a tasty treat recipe that’s packed with other good stuff. Eat these guys instead of dessert or while you’re on the run. They’re tasty with breakfast or whenever you need a quick pick-me-up. And they come together fast! * I’m sure other nut butters and substitutes would work great too. Maybe Nutella? 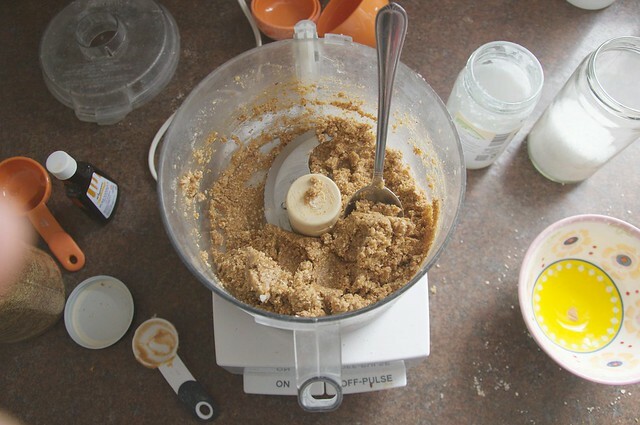 Place rolled oats (uncooked, of course) and almonds in your food processor and blend until smooth (almost like a flour). Then add the rest of the ingredients -- except the chocolate chips -- and pulse until well combined. Fold in the chocolate chips. 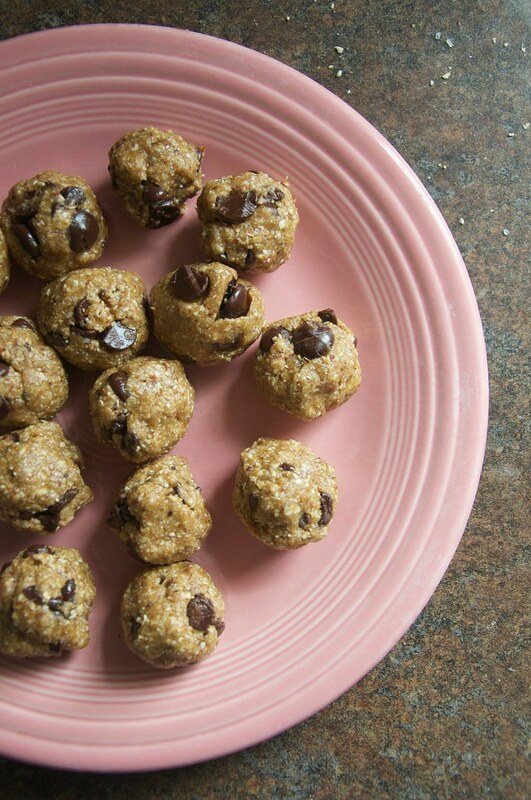 If you’d like your mix less wet, consider adding more oats or coconut flakes to taste. Spoon in heaping tablespoonfuls into your palm and roll into balls. Store in an airtight container in your fridge for a week or more. Ada climbed up on our footstool and took some photos of these bites with her Kidizoom Camera. 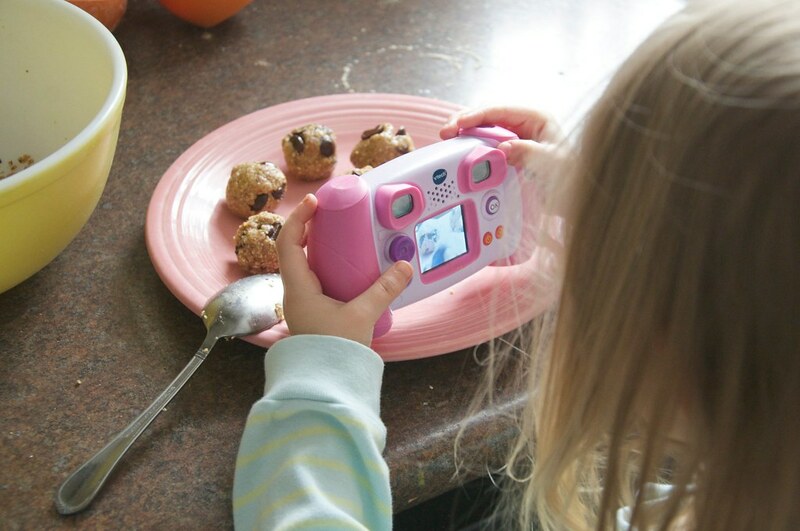 We got it for her a couple months ago because she was starting to show an interest in photography (hmmm, I wonder where she get that from?). Anyway, it’s adorable to see her frame out her shot and excitedly look at the images she gathers throughout the day. I’ll admit it feels somewhat disingenuous to post a recipe right now. But I don’t know what else I should be doing. It’s hard to deal with what’s going on while home alone most days, but I don’t really think I’d feel much differently otherwise. I mean, it’s universally difficult no matter what. I have had a lot of support from friends and family, and I’m so grateful for the love from this community. So, I’ve been throwing myself into taxes and freelance stuff while also allowing myself time to plan the next steps and mourn. I keep wondering what the right thing is I should be doing or feeling. I’m sort of astounded at all the things I’ve dealt with in the last several years. I’ve blogged about most of them, which I’m sure can make this space seem like a drag (sorry) -- but it’s LIFE. Not always the life I imagined living. Sure, we’ve dealt with our fair share of stuff that not many people we know can relate to, but still. I’ve been learning more to take it all day by day, though it’s not always possible. I get down on myself every now and again for having some anxiety and being negative (realistic to a fault? ), but when I look at everything I’ve experienced, I realize I need to give myself a pass on some of it. Why wouldn’t I feel this way sometimes? Is there even a “normal” way to deal with some of these situations? And I wasn’t sure if I wanted to share the play-by-play of all that’s going on now, but I’m so glad I did. It’s been helpful to know that so many have gone through it and come out the other side. I hope my own experience can help someone else not feel so alone. While I don’t always cope in the most textbook perfect sort of ways, I’m learning everyday that I’m stronger than I think I am.